Unlike old-fashioned mass-burn or incinerator facilities, our Green Energy Centers do not burn and therefore do not pollute. Our patents are on advanced thermal conversion technology. When biomass is heated with no oxygen it gasifies to a syngas with about 66% of the energy of natural gas. C6 Technology is an advanced conversion technology that has the ability to produce a clean, high calorific value gas from a wide variety of waste and biomass streams. The hydrocarbon content of the waste is converted into a gas, which is suitable for utilization in gas engines to generate green electricity. It might good in theory, but practice -- and financing, and permitting, and everything -- often proves harder than theory. And while the the trash conversion may not directly create pollution that escapes, burning the gas to fire the power plant would. Nothing's free. The TU reported that GWE's technology is already in use by South African company. Also, something that's a bit unexpected to us: the founders of the company are an attorney, who also founded an "online debt resolution" company (and was on the board of a different waste-to energy company), and the "managing director of a successful chain of restaurants in the NE US." But all that trash will have to go somewhere. 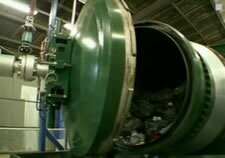 The Albany landfill, which takes trash from more than 200k people in the area, is projected to be full by the end of this decade. It's not plasma arc gasification, but it's a start. @Tim - I was about to say the same. I'm intrigued.